Get the Funk Out! : 5/28/18 9:00am pst - Elizabeth Partridge, author of Boots on the Ground, called in to the KUCI studios! 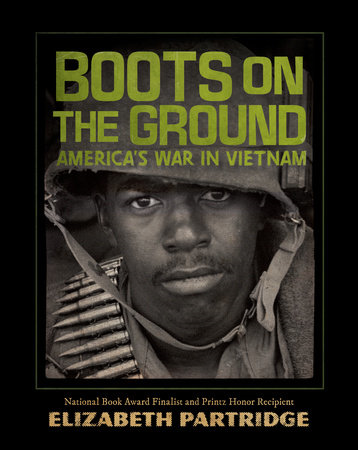 5/28/18 9:00am pst - Elizabeth Partridge, author of Boots on the Ground, called in to the KUCI studios! LISTEN to today's conversation with Elizabeth Partridge! America’s war in Vietnam. In over a decade of bitter fighting, it claimed the lives of more than 58,000 American soldiers and beleaguered four US presidents. More than forty years after America left Vietnam in defeat in 1975, the war remains controversial and divisive both in the United States and abroad. Elizabeth Partridge graduated with a degree in women’s studies from the University of California, Berkeley, and later studied traditional Chinese medicine. She was an acupuncturist for more than 20 years before closing her medical practice to write full time. Elizabeth is a National Book Award finalist, Prince Honor winner, and author of several nonfiction books for children, including Restless Spirit: The Life and Work of Dorothea Lange;This Land Was Made for You and Me: The Life and Songs of Woody Guthrie; John Lennon: All I Want is the Truth; and Marching for Freedom: Walk Together, Children, and Don’t You Grow Weary. She lives in the San Francisco Bay area.